It’s a beautiful fall day. Summer has finally given up its hold on the city and the weather is cool, a light breeze hinting of briskness floats by. Soft morning light filters through the trees as the occasional leaf drifts down. You scan the ground for pecans to harvest and horse apples for decoration as you walk along. The pitter patter of racing feet gently comes past your ears, sometimes swooshing by at lightening speed. General hilarity of an earthly, almost primal kind that is beautiful in its simplicity surrounds you as you walk the path sipping your favorite morning coffee beverage. A soft touch briefly grazes your hand before disappearing as silently as it arrived. The simple delight of another wonderful, refreshing morning at the dog park washes over you as you watch one or more of your best friends in the whole world frolicking with abandonment. It doesn’t seem that long ago that to have this wonderful morning would require owning 40 acres in the Texas hill country or some other remote, wonderfully open location. If you live in Europe and have a dog, this is quite possibly part of your daily ritual that has gone on as long as anyone can remember. It is common to take long walks with friends and the cumulative pack of dogs, sometimes numbering 30-40 or more. 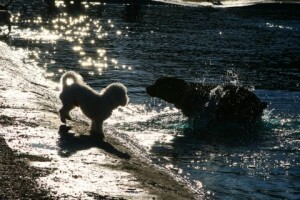 A time honored practice to provide social interaction and exercise for both people and dogs. These group walks build and strengthen the bond between dogs and their owners. Dogs learn from dogs how to behave, play and interact with socially acceptable dog to dog communication skills. They learn conflict resolution without leaving a mark or calling their attorney to drag it out. Young dogs learn that it is not okay to tap dance on the heads of other dogs without asking permission first. Most importantly though, dogs learn to follow you, their “leader”, and look to you for direction as to where the pack (you and the others) are going. To not do so, instinctually, would put them at risk of being separated. For this reason when you visit a dog park, make it a point to keep moving. Walk the entire park and minimize the amount of time that you are staying in one place visiting or leaving your dog to his own devices. Hide behind trees when your dog is looking the other way, praising him when he finds you. In doing so you teach him to keep an eye on you, care where you are. Leaders are followed, they don’t follow. Being a good leader to your dog will create a wonderful bond between you and enable him to feel safe in a very human world. On September 24, 2004 when the award winning Millie Bush Bark Park was opened, Houston was reputed to be the last major U.S. city without a dog park. Thanks to foresight, dedication and five years’ hard work by Houston Dog Park Association’s founding members, and the commitment of our city and county municipal leaders, the greater Houston area now boasts approximately 30 off-leash dog parks with more being built all the time. Way to go Houston! Since 1999, member volunteers comprising the Houston Dog Park Association have continued to advocate and fund raise for new parks and improvements to existing parks. Education is an increasing focus as well to teach dog owners about good dog social behavior, play and dog park etiquette. Do you want to be a part of something very rewarding and great for Houston area dogs? Become an HDPA member today and join the fun of helping do great things for dogs and their owners. We’d love to have you! Check us out at www.houstondogpark.org. Crista Meyer is a dog trainer, co-owner of Urban Tails, HDPA member and Chair of HDPA’s Training & Education Committee. She can be reached via Crista@HoustonDogPark.org.